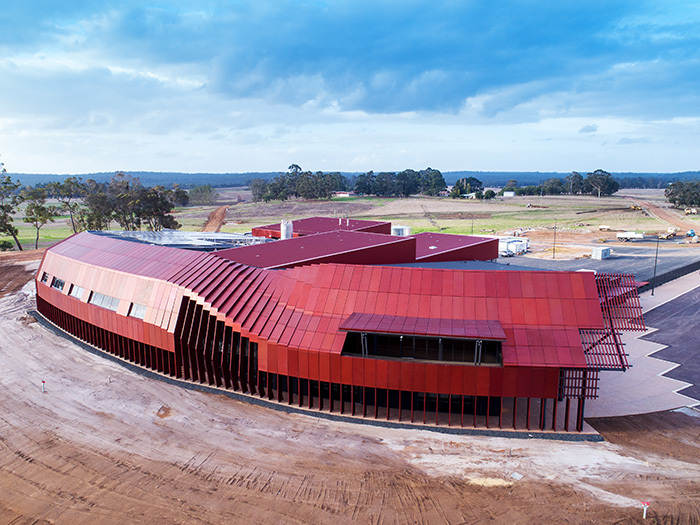 Opening 2018, the stunning Bannister Downs Dairy Creamery is a world class facility housing state-of-the art robotic milking equipment, administration facilities, café function area and an exhibition gallery and viewing platform to the processing areas. DENMAC was responsible for the construction of the highly complicated façade which has created a truly unique building which will stand the test of time. 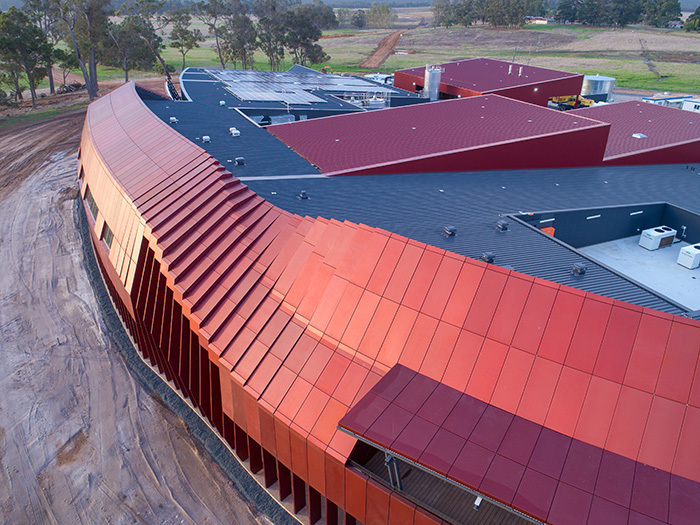 DENMAC was awarded the prestigious Subcontractor of the Year award as well as Subcontractor of the Year – Cladding for work completed on Bannister Downs Dairy at the 2018 Master Builders-Bankwest Excellence in Construction Awards 2018. The façade on this project was one of if not the most complex Façades that DENMAC has completed in our thirty (30) years of history. 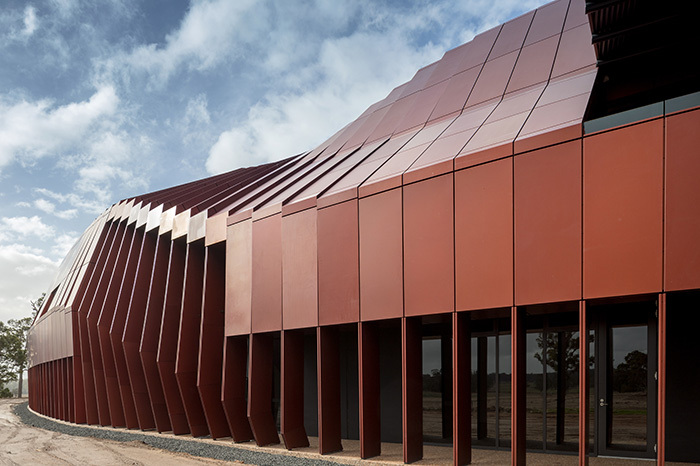 Importantly, except for the raw aluminium product, the Façade was completely designed, fabricated and constructed in Australia. 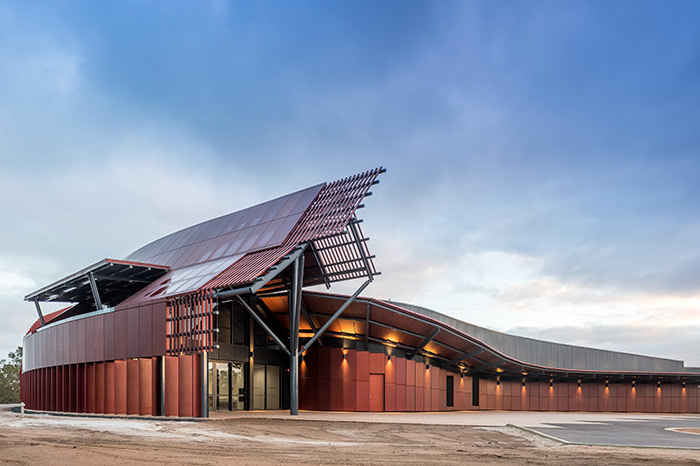 DENMAC was contracted by Perkins to deliver the anodised aluminium façade to the Bannister Downs Dairy Creamery in Northcliffe, Western Australia. 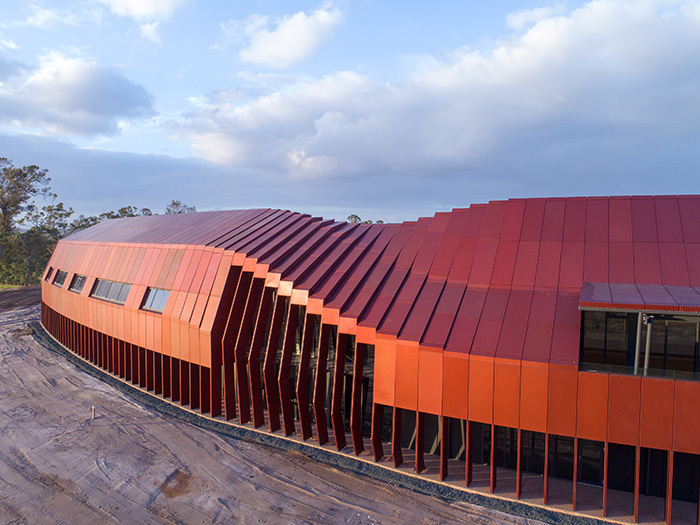 This was however far from a simple anodised aluminium façade…this façade has it all – curves, rakes, twists, step-changes, peaks, extreme gradients, bespoke anodised colour that only one anodiser can produce in Australia who happens to have their manufacturing facility on the East Coast, and all installed in the middle of a cow-paddock hundreds of kilometres from the nearest capitol city…just the challenge DENAMC thrives on! The design works commenced in 2016 with initial meetings with the Architect, Perkins and other specialist consultants to decide how in fact the façade could be delivered. It was determined early in proceedings that the roof would be installed early to weather-proof the building and enable internal works to continue, leaving DENMAC to then install the complicated façade over the roof line. Whilst this somewhat removed timing pressures, it created an enormous design challenge to work with the installed steelwork and roof structure but delivering a façade that did not follow the roofline. The DENMAC design team worked with the steel model to provide the basis for the design of the aluminium façade. As detailed in the “Innovation” section, this model combined with physical scanning & surveying provided major input for DENMAC’S design efforts. A roof bracket and truss system was developed to allow the aluminium façade to be built off the roofline. Ensuring that the brackets were installed in the correct location was the first design challenge as everything stemmed from this initial set-out. Between the brackets and truss design, this provided us the tolerance to build the Façade. The installation of brackets commenced in mid-2017, months before the physical installation of panels onsite. The were 1,262 panels with very few the same size and shape with an extremely small margin of error. Some of these panels required 20 individual folds. 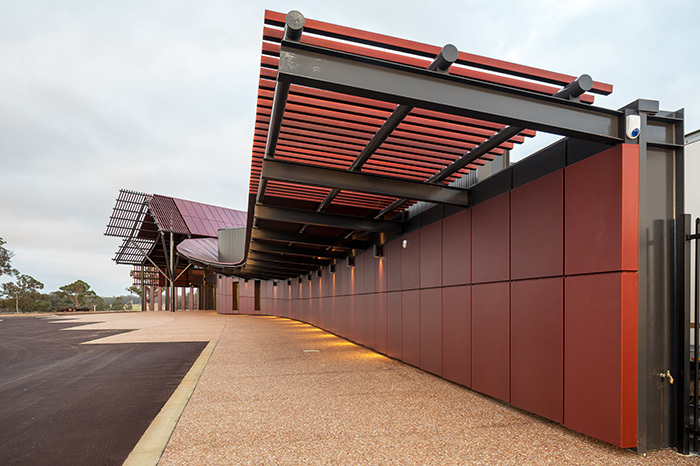 The anodising colour could only be produced by one anodiser in Australia, Sapphire Anodisers in Gosford, NSW. 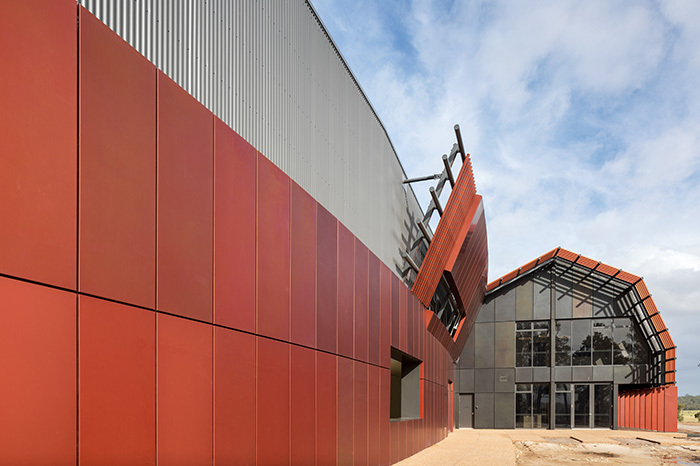 This created an enormous logistical challenge with the raw aluminium being shipped into Sydney, two Sydney fabricators quality checked and engaged by DENMAC to punch and fold the individual panels, batches of panels were then trucked up to Gosford for anodising, before being packaged in stillages and trucked in batches and staged over months across the Nullarbor to Northcliffe in the far south of our state. The installation program was relatively compressed given the scale of the project façade and the timing of the completion of the project. Staged over a period of six (6) months, multiple teams were engaged across multiple work-fronts to install the large numbers of panels. This required strong communication between DENMAC’s head office design team, our design consultants (Inhabit) and the site install team. Multiple trips to site (comprising a ten-hour round trip) were scheduled to ensure strong alignment by all parties.